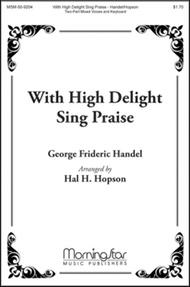 With High Delight Sing Praise composed by George Frideric Handel (1685-1759). Arranged by Hal H. Hopson. For 2-part mixed choir and keyboard (3-part Mixed). Festival. Medium. Octavo. Scripture: Psalms 81. Published by MorningStar Music Publishers (MN.50-9204).With Scripture: Psalms 81. Festival.Based on Psalm 81:1,3. Accessible arrangement from Handel's "Dettingen Te Deum" for small choirs. Abundance of florid passages in typical Handelian style. Festive number.